2 Corinthians 4:6-15 For God, who commanded the light to shine out of darkness, hath shined in our hearts, to give the light of the knowledge of the glory of God in the face of Jesus Christ. 7 But we have this treasure in earthen vessels, that the excellency of the power may be of God, and not of us. 8 We are troubled on every side, yet not distressed; we are perplexed, but not in despair; 9 Persecuted, but not forsaken; cast down, but not destroyed; 10 Always bearing about in the body the dying of the Lord Jesus, that the life also of Jesus might be made manifest in our body. 11 For we which live are alway delivered unto death for Jesus’ sake, that the life also of Jesus might be made manifest in our mortal flesh. 12 So then death worketh in us, but life in you. 13 We having the same spirit of faith, according as it is written, I believed, and therefore have I spoken; we also believe, and therefore speak; 14 Knowing that he which raised up the Lord Jesus shall raise up us also by Jesus, and shall present us with you. 15 For all things are for your sakes, that the abundant grace might through the thanksgiving of many redound to the glory of God. Mark 8:34-9:1 And when he had called the people unto him with his disciples also, he said unto them, Whosoever will come after me, let him deny himself, and take up his cross, and follow me. 35 For whosoever will save his life shall lose it; but whosoever shall lose his life for my sake and the gospel’s, the same shall save it. 36 For what shall it profit a man, if he shall gain the whole world, and lose his own soul? 37 Or what shall a man give in exchange for his soul? 38 Whosoever therefore shall be ashamed of me and of my words in this adulterous and sinful generation; of him also shall the Son of man be ashamed, when he cometh in the glory of his Father with the holy angels. 1 And he said unto them, Verily I say unto you, That there be some of them that stand here, which shall not taste of death, till they have seen the kingdom of God come with power. Exaltation of the Cross, 2008 – Who is this Son of Man? Brothers and sisters: Below is an excellent, simple and powerful homily about the cross. It is worth 5 minutes of your time. At the end of the homily is the link, from an excellent blog I read when I can. Services TONIGHT, FRIDAY, Sep 13/26 – Vigil, 6:30 PM. If you can only come late, that is okay, because, at the end, we prostrate before the cross, singing "Before Thy Cross…". This is one of the finest and holiest moments of the entire church year. SATURDAY – 9 AM, Divine Liturgy for the Precious Cross. Other Saturdaty services as usual. The following is a homily delivered by His Grace Bishop STEFAN of blessed memory on the Feast of the Elevation of the Holy Cross, from 1982. He was well known among Serbian Orthodox for his sermons which were simplistic and easy for the people to understand. We are celebrating the Elevation of the Holy Cross today, dear brothers and sisters. This is a feast that reminds us of the event when the Cross on which our Lord Jesus Christ was crucified was found in Jerusalem. 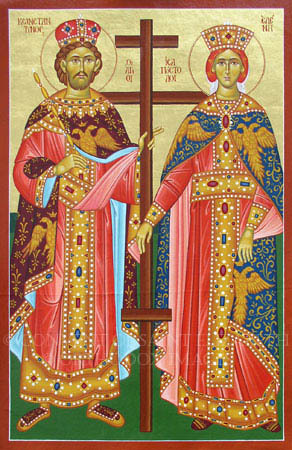 Church Tradition tells us that St. Helen, the mother of Emperor Constantine, miraculously found the True Cross of Christ on Golgotha. This was at the beginning of the IV century. From that time a tradition began of celebrating this event on September 14. The celebration began first in Jerusalem in the Church of the Resurrection, built by the holy Emperor Constantine on the spot Christ was crucified. That day there was an elevation of the holy Cross of our Lord, elevated so that the people might see it and fall down before it. Taking the example from the Jerusalem church, Christians throughout the world did the same and thus this tradition came to us as well. This feast was confirmed all the more in the year 627 when the Byzantine Emperor Heraclius freed the Cross from the Persians who held it for fourteen years. From that time many Christians made pilgrimages to Jerusalem for the feast of the Elevation. In the holy gospel it is written that crucified with our Lord Jesus Christ on great and holy Friday were two thieves, one on either side “and Jesus in the center” (John 19:18). And so the crucified Savior and His Cross has remained in the center of the Christian faith, the services and the entire life of the Christian. This is why St. Paul says, “we preach Christ crucified” (I Cor. 1:23). The truth of the crucified and resurrected Christ is found in the center of the gospels. This is not only one of the truths of the Christian faith, it is the most significant Christian truth. St. Paul says to the Corinthians, “For I have delivered to you first of all that which I also received: that Christ died for our sins according to the Scriptures, and that He was buried, and that He rose again the third day according Scriptures” (1 Cor. 15:3-4). This central truth of the Christian faith was preached by the apostles “first of all”. “Christ died for our sins”, that we might receive the forgiveness of our sins from God. “He rose again on the third day”, that we too might defeat sin and have life. The miraculous sign of this truth is the Cross of Christ. For this reason do we occasionally see His crucifixion pictured on one side of the cross, with His resurrection on the other. If this truth were taken out of the gospel then the gospel would cease to exist. Gospel means “good news”, which came since Christ came to the world, suffered for mankind, resurrected defeating Satan and received for all mankind the forgiveness of sins and life eternal. Despite the bad news of man’s sins and guilt, this gospel is the “good news” of the reconciliation between man and God. The righteous One suffered for the unrighteous, the Sinless for the sinners, so that He might bring all men to God the Father. He offered Himself as the blameless Lamb to the sacrifice for all men and all times. He offered Himself to death that He might defeat death. Therefore the Cross on which Christ was crucified, instead of it being a sign of sadness and mourning has become the sign of the greatest joy, the sign of the strengthening of faith and hope. It has become the throne of love, the sign of mercy, proof of forgiveness, the carrier of grace and the flag of peace. At the same time the Cross is the mystery of our faith – the mystery of the redemption of mankind. How can we explain this mystery? It cannot be the subject of human investigation and human philosophy, but is experienced through sincere faith and love and our humble thanksgiving to God. For the width of the Cross is equal to the depth of heaven, as the poet says. This is not only a sign of our faith. It is not only a symbol which signifies something. It is not only a decoration which we adorn ourselves with. This is life with the God-man, who suffered because of human injustices, sins and lawlessness. With the Cross we constantly live and always partake in all sufferings for the sake of God’s truth, justice and love. This is true sympathy with all who suffer for God’s truth and justice. It is the sign of a Christian life in Christ and according to Christ. It is the sign of life in love and life in sacrifice for good. It is the living sign of self denial for the sake of God’s truth and justice. For this reason do we celebrate the Cross. We celebrate the Cross as a holy sign which helps us strengthen our faith. It is the sign which strengthens our hope in the victory of God and His justice. We wear it on ourselves and carry it in ourselves as a sign of God’s mercy towards mankind and we experience it as a sign of our mercy towards our neighbor. The Cross is a sign that witnesses to the fact that God forgives. At the same time, the Cross is a sign of our will to forgive. The Cross calls us to preach the crucified and resurrected Lord. It reminds us of all the things that our Savior did, who was crucified for our salvation. The Cross calls us to always proclaim “Christ crucified …. the power of God and wisdom of God” (I Cor. 1:23-24). Today, on the Feast of the Elevation of the Cross, we elevate the Cross of Christ, that we might lift our souls and hearts higher towards the crucified Lord. And that we might have a deeper and stronger experience of His Cross, glorifying Father, Son and Holy Spirit, now and ever and unto the ages of ages. Amen. You are currently browsing the archives for the Great Feasts:Exaltation of the Cross category.